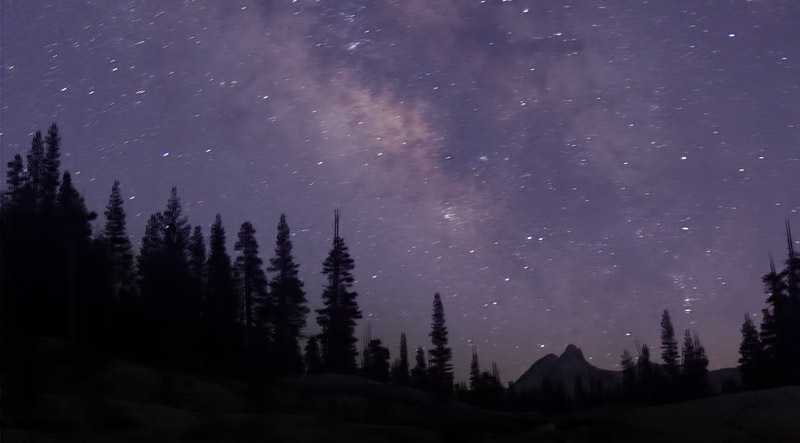 In a recent article I explained how you can bump up the brightness of stars using a simple layering trick in Photoshop. In this article we will be going in the opposite direction. 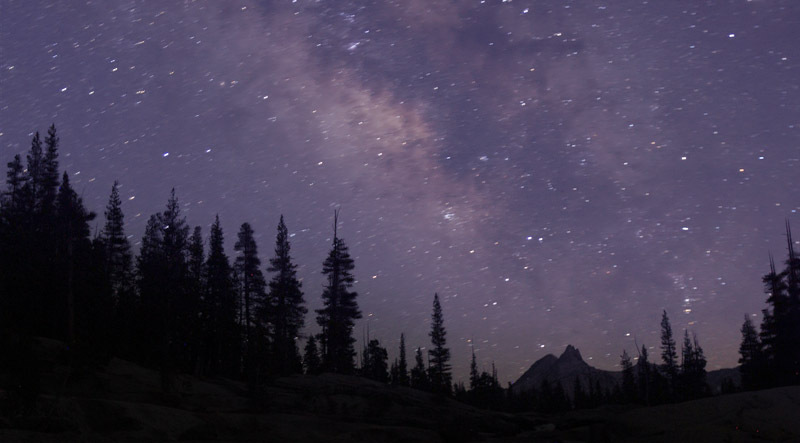 Instead of increasing the contrast of stars our goal will be to reduce the streaking that results from long exposures or exposures at a long focal length. For background on streaking, please refer to the article The 600 Rule which as rules go is a pretty bad rule. For the streak reduction procedure we only need one image. Open the document in Photoshop. 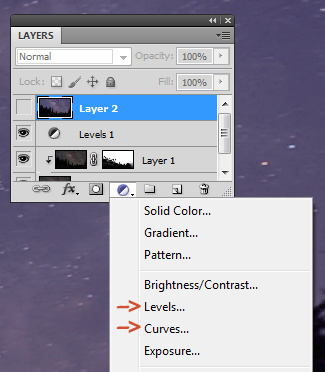 Change the new layer blend mode to Darken. Select the move tool to “nudge” the top layer in the direction of the predominate streak (in this case up one and right two). It helps to zoom (Z) pretty far before making the nudge. To make it easier to see what you are doing, you can apply a curve to lighten the image. Make sure to drag any temporary adjustment layer to the top of the layer stack. Background plus nudge foreground, unmasked. Fortunately it is easy to undo that duplication by masking off the area by painting black on a layer mask. Here is the same darkened layer combination, but I have created a mask and painted out the area around the duplicated tree tops. To create a mask click the icon that looks like a camera on the Layer Tool – it’s just to the left of the adjustment icon shown earlier. Tree duplication has been masked off here. This image looks better. Now we might want to apply the bump operation using the combined background and nudged darken layer. There are three ways to get the layers combined: use flatten image, select the two layers and select layer-merge, or – and this is a really useful trick, use the keys: Ctl-Alt-Shift-E (that’s how I got Layer 2). On the Mac you use Option rather than Alt. Two ways to get to the flatten or merge operations include clicking on the tool bar under “Layer” or clicking the tiny little menu icon at the upper right of the layer tool window. This destreak method works best if you are not using a wide or ultra wide view. 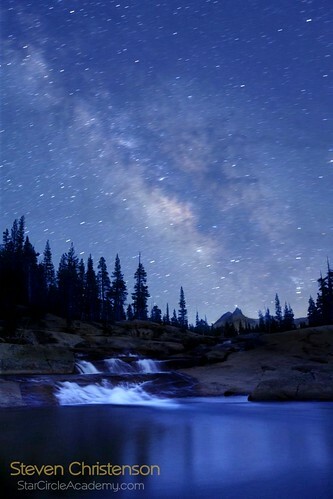 With a really wide view, the star streaks are not uniform. The closer the stars are to the north or south poles, the more curved their streaks will be. In another article I will walk through how you can composite together images taken at different times or exposures, as was done below. This entry was posted in Camera, Equatorial Mount, Gaps in Trails, Photo Tip, Stacking and tagged destreaking, streaks, trailing on November 26, 2012 by Steven Christenson.